The voluntary sector is always starved of funds. Unfortunately, it costs hundreds of pounds to design and print even the most basic posters and flyers and, if you're thinking of running billboard campaigns or broadcast ads, publicity costs can easily spiral into the tens of thousands. Since many small voluntary sector organisations rely on unpredictable sources of income like grants and donations to make ends meet, this is clearly out of reach. For the last 15 months, I've experienced the consequences of this tight budgeting first-hand. As the press and publicity officer at Green Chorlton, a volunteer-run group that organises events such as Chorlton's Big Green Festival 2011, I've had to raise awareness of our activities on a shoestring. This year, we managed to print a few thousand flyers and a few dozen posters to promote the festival but then our publicity budget maxed out. On the official Chorlton's Big Green Festival Twitter account @biggreenfest, we've begun using hashtags for the first time. Local news stories are now followed by #Chorlton and our interactive Twitter game is centred on the hashtag #14DaysOfChorlton. 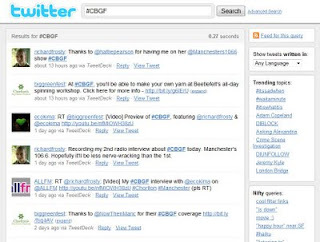 We also launched an official Chorlton's Big Green Festival hashtag, #CBGF, followed immediately by a tweet for new Twitter users explaining how hashtags work. Not only is there the official Chorlton's Big Green Festival Facebook group, there are also event pages for each of our main activities. So the What Next? Forum - Going Through the Roof Facebook page gives users an idea of what to expect on the night and a wall to post messages. They can also indicate whether they plan to attend and, doing the hard work for you, invite friends to come along. The Chorlton's Big Green Festival Flickr photostream features a mix of posters, flyers and event photos. A day after our Beauty and the Bike fringe film night, for instance, we uploaded the top five photos taken at the event. Each one has a searchable title (Beauty and the Bike 1-5) and each has been placed in the 2011 set to make them easier to find. The GreenChorlton YouTube channel contains teaser interviews with volunteers and event footage to show prospective visitors what to expect. There are also some more creative ideas. 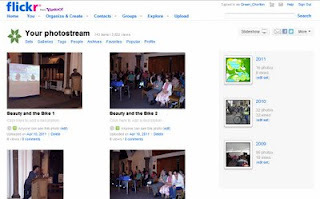 After obtaining an mp3 of a recent radio interview, for example, we added photos on Windows Live Movie Maker to create a slideshow and called it the 'Chorlton's Big Green Festival 2011 preview'. Social media has completely changed how voluntary organisations promote their activities. Money is no longer the barrier it once was. So if you want to publicise your organisation but lack the necessary funds, why not take advantage of the free social media marketing opportunities on Twitter, Facebook, Flickr and YouTube? 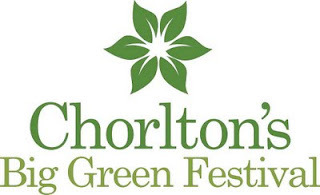 Chorlton's Big Green Festival starts at 11am on Saturday, 16 April 2011. There are events right through to 11pm, including the Green Chorlton Ceilidh and the Chorlton's Big Green Festival After-Party. Meanwhile, the What Next? 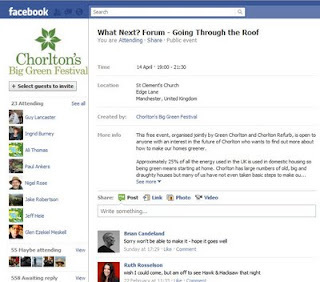 Forum – Going Through the Roof takes place at 7pm on Thursday, 14 April and the interactive Twitter game 14 Days of Chorlton continues until midnight on Saturday. 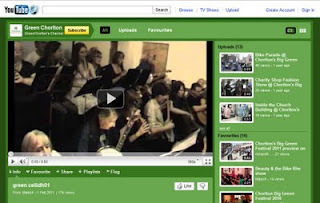 For more information, go to the Green Chorlton website or look on Twitter, Facebook, Flickr and YouTube.